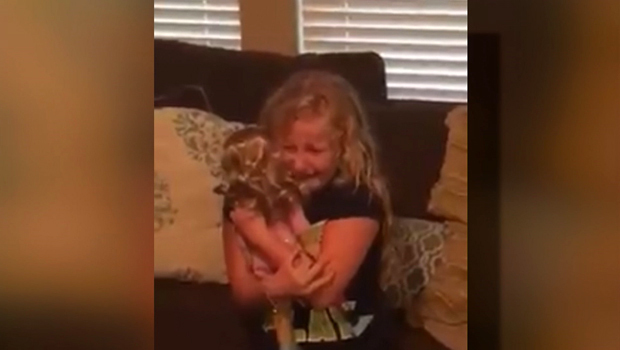 A video showing a Texas girl's excitement at being given a doll with a prosthetic leg like hers has gone viral. Emma Bennett, 10, uses a prosthetic leg because of a rare birth defect, CBS Houston affiliate KHOU-TV reports. She's a fan of American Girl dolls and has wanted a doll that looks like her for a long time, mom Courtney Bennett told the station. Courtney and husband Justin Bennett sent a doll to A Step Ahead Prosthetics, which makes such modifications. The parents recorded Emma's reaction when she opened her gift, and the posted the video to Facebook. As of Friday morning, the video has been viewed more than nine million times.